Two wheels rather than four may be mooted as the solution to the world's road congestion problems; however, this footage shows that even this may not be the answer in some cities. 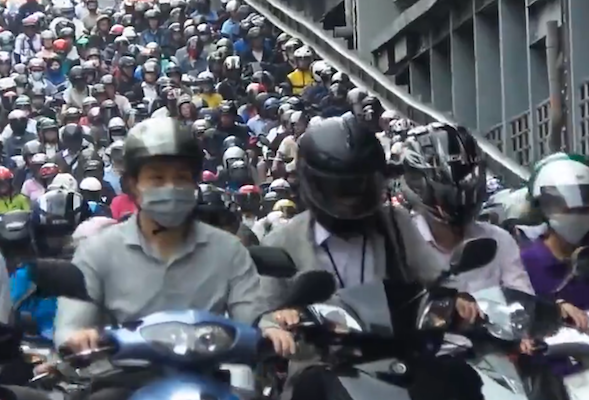 A sea of scooters flows constantly in this clip, reputedly filmed on the Taipei bridge in Taiwan, with many riders – wisely it seems – donning face masks to deal with the air pollution. Scooters are hugely popular in Taiwan as many owners can't afford a car and riders can drive around the traffic which car drivers have to sit in. However, it seems scooters may be a victim of their own success; the Taipei Times reports that there are 415 scooters for every 1,000 people, according to statistics from the country's national directorate general of Budget, Accounting and Statistics.